Source of life for the majority of Aurloks nomadic tribes, large herds of aurochs have always attracted me by the power they exude. So I was delighted when Iyayki Ye, a young wolf Herbs-au-vent, I was invited to share the life of his tribe during Selenes few. I joined their camp in yīkhal, early Wetu, the season of tender herbs. 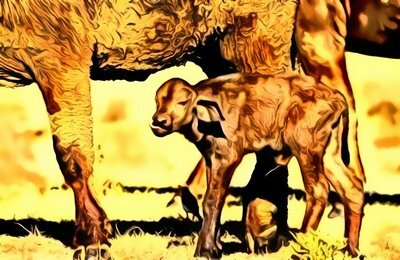 With the arrival of summer, gray aurochs herds ascended the lush meadows of winter Opaye Gadusi and began their migration north. 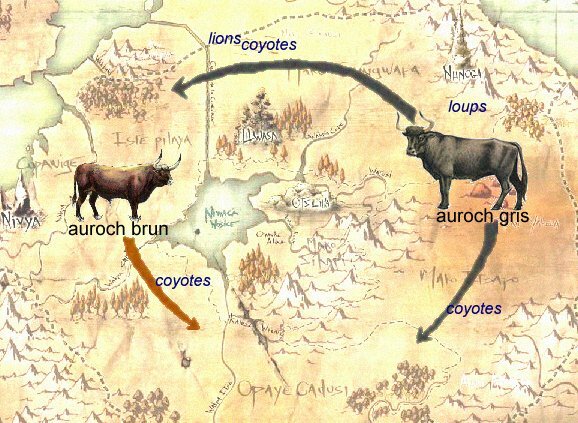 You should know that the aurochs are divided into two species. The aurochs gray form large herds of more than 50 heads and across all of eastern and northern Oblaye Itse, browsing each cycle over 3,000 maki (which can walk ¼ hour). Brown aurochs, much more massive, form herds of 20-30 heads and move from north to south of Opaye Gadusi to Itse Pilaya. When I joined the Herbes au vent south of Mako Itsapo they were folding their tents to track a herd of 42 heads to pregnant females. The timing was not right for me to welcome, let alone to ask them about the size of the herd. I helped as best I could to the load distribution on the bouraks, holding me as far as possible from their huge horns and looked hunters stow all with speed and accuracy. The animals were loaded poles, canvas and leather, but there were still many bags on the ground. Each took one, two or three, depending on his size. I could do no less than take two, three bear was out of my ability. Clan members took the last aurochs, none wore less than five! The sachem Olakol Wicayesni poorly controlled his impatience, the tribe must reach the red grass, his wakaga before the flock. A new march began for me, my master had happily used my members. Under the encouragement of the sachem, we skirted the Atalvi Asila, fire mountains, taking us away from the arid lands of the east. I noticed that many herds went up north in the same direction as us, it either does not linger in Mako Itsapo. The steps were long, so it took us a few days to see the glowing hills where we could set up camp. Everyone knew the location, selected hundreds of cycles ago by the ancestors of Herbs-au-vent. 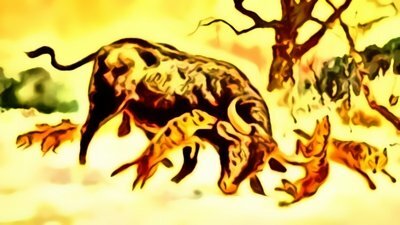 Their shaman told that long ago, two families of children–of–the tree had lost for trying to protect a young female aurochs chased by tigers. The legendary felines had been forced by famine to a very long winter and had left their lands in the east. It is the wind that the two families Aurloks overcame. Unable to find their tribe without abandoning the female, they founded a new tribe, them, while the young female was behind the herd from which they were responsible. Time passed more slowly now that the camp had been established. Herds spent a few days in the hills, then resumed their slow march to the west and abundant pastures. One morning, perhaps the sixth day after our installation, trackers returned and shared their excitement with the tribe. The herd was coming, our herd. It was time, females had heavy flanks and were advancing with difficulty. Calving was very close. The evening was long. We had to ask for help from Waga. All aurochs tribe gathered around the shaman to begin singing and dancing, and then came the time where ancient tales repeated the history of the tribe. Finally, hunters all received a new amulet, indicating the role they have to play in the coming days. Olakol did me the honor to get over a yellow and red, indicating that I could get inside the herd to reassure males. My coat was dark, in his view, the guarantee that I would be accepted. The next day, a group of hunters approached the herd. I watched remote stand for animals and talk to them. After scoring some signs of anxiety, let hunters flock to dwell within them. I made the following group, we reproduisîmes the same gestures with males. It was difficult for me not to let myself be impressed by their size and I was content to deal younger. The words of my companions were unknown to me, so I used mine to introduce myself to the beasts. Some, of this curious novelty, turned away to come to me. The third day I noticed a new group that, this time, took care of pregnant females only. They caressed their muzzles, their hands were following the neckline and down to the belly to evaluate the unborn calf. 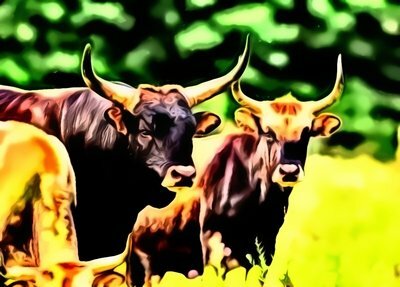 This group, consisting solely of aurochs warriors sat in the center of the herd and intoned a sweet song that evoked the passage of the wind in the tall grass. They began the next day, while the first group with males and some females began to calve. For seven days we have again the same process. 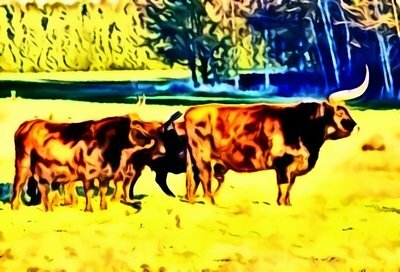 Warriors aurochs helping females to give birth, we reassuring other males. A group that I had not yet seen action, Crow, watched around the herd, javelins ready to burst at the slightest threat. When the birth of all the little ones was correctly placed, a new festival in honor of Waga was organized. This time it was the Wolves who organized songs and dances to thank their Manitou packs of keeping away from the herd. The elders told the story of the bull who had stood up to a pack overnight to protect young people who had just been born. Leaving an old male herd away, he had hunted down the pack to the foot of Atalvi Yagleya where he had finally offered her carotid. I remembered having seen this scene carved on one of the totems marking the camp. The season drew to a close. We had reached the Wakpa Cepe and the herd now amounted to seventy-three heads. Some animals had died during the trip, victims nocturnal hunts wolves Mako Sungwapa but Herbes au vent were proud of their season. They were going to let the animals cross the river and join the tribe of Chant-de-la-Prairie to help them cross the canal de la Concorde. Then they accompanied him to me Otsiliha, members of the tribe still spoke to me of coyotes living north of the great forest that threatened the herd. They also spoke to me of the terrible lions sand which sometimes came out of Mako Skanzi, yellow desert to pounce on the flock. Seeing my astonishment, they told me that, three cycles before their own herd had almost disappeared after the attack of a single pair of lions. More than half of the animals had been left for dead, which explained the strong protection that the tribe offered them. But with the birth and the last cycle thereof, the number of head was now sufficient for the herd protects only. A few days later, I left the tribe reluctantly to join my master Agerzam to Otsiliha. Les Herbes au vent walked away to the north, to join other tribes for a powwow along the Wakpa Cepe.